I love my old friends. She leaves for California tomorrow - I'm gonna miss her! My new Home Group leaders - Lou & Teresa! This is at Lou's retirement party. Some of the girls from my 3rd & 4th grade class last year...three of them moved up, I will miss them. So - I did not get the job at the Cultural Arts Center. I found out on Thursday that they offered it to someone else. I was disappointed. There was a lot of build up to this job and the opportunity to apply, so it was a little bit of a let down. However, I am so grateful to God that the disappointment did not last too long. He is so faithful and reminded me of His goodness, His sovereignty, His purpose. My mom told me about a Phil Keaggy song which had the line Disappointment - His Appointment, So I looked up the words - they describe a lot of what the Lord is teaching me! I am so grateful that He has ordained all my days and that His purposes are good. I am actually excited about seeing what He has planned! Whose? The Lord's who loves best. Who my faith and love would test. Treasures from His love untold. The pennant race is in full swing! "The Red Sox don't just own baseball's best record. 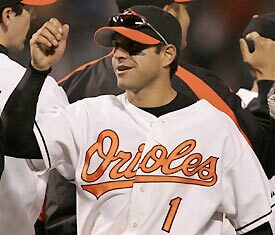 They have become MLB's model organization..."
Meet Brian Roberts, 2nd Baseman for the Baltimore Orioles. 2. He plays on my favorite team. 3. He holds the SEC record for stolen bases (67), and has 42 SB so far this year. "Brian Roberts has the right priorities as a professional athlete. In 1999, when he was drafted by the Baltimore Orioles in the first round of the amateur draft, he postponed signing with the major-league team. Why? Because he was invited to be a Huddle Leader at an FCA Camp in Black Mountain, N.C."
www.joshharris.com - Check out my sister's testimony! Thursday...went to my interview. 3 people asking a total of 15 questions in 45 minutes. It was all a blur afterward. Some good parts, some parts I struggled through. I should hear back in the next week. Friday...I left early and went to CHARLOTTE!!! It was an awesome weekend with old friends. I stayed till Monday - it had been forever since I had gone for a nice long visit. Kendra captured the weekend very well on her blog...so I won't bore you with every little detail. Just to say that it included lots of great food...and waitresses....Joe Bakita asking if I was 'family'...a reunion of the 25 year old singles ministry (+ jr member, Stretch)....and a dance party....and Kendra's b-day dinner at PF Chang's.